Mark Hartsoe is devoted to representing clients who have been injured and family members who have lost loved ones as a result of the negligent conduct of others. The firm’s main office is conveniently located in the heart of Maryville, just across from the Maryville TARGET and next door to Lemon Grass restaurant, Aubrey’s restaurant, Starbuck’s, and Shoney’s. We have ample free parking and will work around your schedule for the best meeting time for you. The Hartsoe Law Building is located between the Blount and Knox County Courthouses for ease of access to Court. Maryville personal injury lawyer Mark Hartsoe represents clients who have been injured in car accidents, truck accidents and motorcycle accidents as well as injuries on property (slip and fall), inadequate security, burn injuries, defective products, injuries to children and wrongful death. 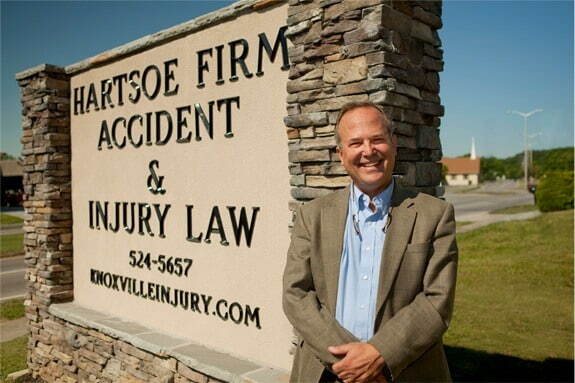 Mr. Hartsoe has extensive experience in accident and injury cases in Blount County and throughout Tennessee. Mr. Hartsoe has handled numerous car wreck cases involving parties injured on Alcoa Highway, Lamar Alexander Parkway as well as other roads and highways in Maryville, Alcoa, Blount County and throughout Tennessee. Mr. Hartsoe is known as the “go to guy” for motorcycle cases in Tennessee and has represented numerous injured motorcycle riders who have been injured on the Dragon and throughout Tennessee. The Hartsoe Law Firm prides itself in thorough preparation, hard work and result- oriented representation. Many times, Mr. hartsoe like to visit in his clients’ homes to get a better appreciation of how the injury has affected the person and family. Mr. Hartsoe has lectured to other attorneys and claims adjusters regarding handling automobile accident cases from the plaintiff (injured party’s) perspective as well as how the handle Tractor trailer wreck cases in order to maximize your recovery. Mr. Hartsoe attends continuing legal education and injury lawyer conferences throughout the year to stay abreast in developments in the area of injury law, especially in the area of car accidents, track wrecks, medical malpractice, motorcycle wrecks and trial practice. A brief list of the types of cases handled by Mr. Hartsoe is listed in the results section of knoxvilleinjury.com. The Hartsoe Law Firm is ready to represent you in your injury case-whether it’s a car accident, truck wreck, motorcycle crash or other serious injury or wrongful death claim, let us put our 27 years of experience to work for you. Call a Maryville personal injury attorney at the Hartsoe Law Firm team today! After completing law school at the University of Tennessee, Hartsoe and his wife moved to a farm in the Friendsville area that had been built by his wife’s grandfather, Shirley Houston Jones. The Jones’ family were long time farmers in the Union Grove section of Friendsville on Big Springs Road. The Jones farm, which has been in the family since before the Civil War, continues to be operated by the family. Mark and his family live in the City of Maryville but also enjoy the rural character of Blount County at their farm located in the foothills of the Great Smoky Mountains in Walland, Tennessee. The family has sold its farm produce at the Maryville Farmers’ Market in past growing seasons. Mark has served on the Board of the Foothills Land Conservancy for six years and has coached soccer in Blount County. All three of his sons have either graduated from Maryville High School or currently attend Maryville city schools. Mr. Hartsoe represents injured parties throughout the Blount County area including Maryville, Alcoa, Walland, Townsend, Rockford, Ellejoy, Greenback, Friendsville, and Louisville areas. In addition to representing injured persons and their families in Blount County, Mr. Hartsoe represents clients throughout the State of Tennessee who have been injured as a result of the negligent conduct of others. A significant number of Mr. Hartsoe’s clients are recommended by former clients who have been pleased with the legal services provided by Mr. Hartsoe. In addition to client recommendations, other lawyers from Tennessee and other states refer matters to Mr. Hartsoe to be handled on a referral/co-counsel basis. Mr. Hartsoe has been recognized as one of the Top 100 Trial Attorneys by the American Trial Lawyers Association. Only the top 5% of the lawyers in Arkansas, Mississippi and Tennessee are named in Super Lawyers. Membership is limited to trial lawyers who have demonstrated exceptional skill, experience and excellence in advocacy by achieving a trial verdict, award or settlement in the amount of $1 million dollars or more. Upon recommendation of its advisory board and following evaluations of effectiveness and accomplishment in the practice and discipline of litigation in trial and appellate courts, excellence in the art of advocacy, and the highest ethical standards and integrity, Hartsoe was certified as being selected as a Fellow of the Litigation Counsel of America in 2008. The Verdict Club is an elite society of litigators established to recognize and promote superior accomplishments of its professional as measured by the achievement of significant settlements and verdicts. The Hartsoe Law Firm, P.C. is devoted to representing persons who have been injured and families who have lost relatives due to the negligent conduct of others. Founding partner, Mark C. Hartsoe, is a Tennessee lawyer with 33 years of legal experience litigating serious personal injury cases and other complex matters in state and federal courts. Hartsoe is a 1985 graduate of the University of Tennessee College of Law. Before founding the Hartsoe Law Firm, Mr. Hartsoe was a Senior Partner at a large law firm for 10 years before realizing his life long ambition of having his own law firm. The Peroulas family and I deeply appreciate your help and expertise. Although I am certain that it would have been most enjoyable to work with you on the trial, my clients are happy with what they and I believe to be a very favorable settlement, thanks in large part to your guidance. James S. Tipton, Jr. Downtown Knoxville Office available for meetings & depositions. We serve clients throughout Tennessee including those in the following localities: Anderson County including Clinton and Oak Ridge; Blount County including Louisville and Maryville; Campbell County including LaFollette; Claiborne County including Tazewell; Cocke County including Newport; Cumberland County including Crossville; Fentress County including Jamestown; Greene County including Greeneville; Hamblen County including Morristown; Hamilton County including Chattanooga; Jefferson County including Dandridge and Jefferson City; Knox County including Knoxville; Loudon County including Greenback, Lenoir City, and Loudon; Monroe County including Madisonville and Vonore; and Sevier County including Gatlinburg, Pigeon Forge, and Sevierville.